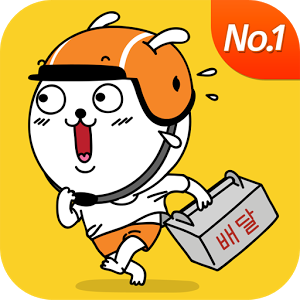 South Korea is a 배달나라 (country of deliveries), where deliveries are commonplace and widely used. Especially for food deliveries, their service is speedy and wonderful. How was my bae-dal (배달) experience? I got this totally cute baedal image from 배달통, a mobile app for food delivery service. First, get the restaurant's number. Then, prepare yourself for what seems to be a fast speed conversation which might make you fumble, bite your nails, trying to remember all the available Korean vocabulary you actually have. I'm kidding. Really. Well, it's really not that hard, because most of the staff answering the phone have a certain format of asking for stuff, and it's pretty much the same everywhere. They are highly efficient, and probably have tons of stuff to do, so they won't ask you anything more than necessary. Mainly just 2 things: your order + your location. In my last trip to Korea, I ordered 교촌치킨 (Kyochon Chicken) and a nearby 맛집 희래등중국징's 짜짱면 (jjajangmyeon) and 탕수육 (sweet and sour pork)! To be honest, if you're reading this post on how to call for food delivery, I'm guessing you already have a certain level of Korean proficiency: at least knowing how to read and write the language. So I'm going to write out some stuff in Korean here without much translation, ok? Have the exact location ready on hand. If you're nervous, take a deep breath and practice reading your Korean address several times before calling. 1. When they pick up, tell them you want delivery. 요기 [어디어디] 이죠? 배달주문 하고 싶어요. 홍대에 마포구 동교동 [building name] 오피스탤 [number]다시 [number] 번지, 몇층 이예요. 2. After confirming your address, they will ask you for your order: 주문 어떻게 되세요? 치킨 3마리 오리지날, 2마리가 허니 오리지날, 그리고 한나더 반반 오리지날 주세요. 4. After writing down your orders, they will repeat your order and you just have to confirm. They will also inform you how long the wait is - half an hour, an hour, etc. I love ordering 배달 in Korea because it is so fast and convenient! While the first few times might leave you tongue tied, just muster some courage and really, you'll find that it's not that difficult. - From 구 to 동 to 거리, it's really just your 'avenue', 'road', 'street'. Hence, make sure you have the full address and state it clearly and properly. - 다시 = da-si (which is common in Korean addresses). For example, in your address, you'll see numbers like 108-27, then just say 백팔 다시 이십칠 번지, for example. If you are staying in a hotel or an officetel, remember to also provide the room / apt number (몇호) and the floor you're staying at (몇층?). Hope this post has been useful for you!